Journaling. You either love it, you hate it, or you just aren’t too sure about it. But journaling doesn’t have to be lame and boring. There are countless ways to journal! You can customize your journal experience to fit your unique needs. There are also a ton of benefits to journaling. For example you can boost your creativity, increase your communication skills and lower your stress. In this video I go over the benefits to journaling as well as a handful of techniques you can try today. Love this blog? Do you enjoy The Goddess Life Podcast or my YouTube channel? Check out Patreon, where you can be a contributor and receive some pretty awesome and exclusive rewards! Essential oils are excellent at helping us with a myriad of emotional needs. That’s because our sense of smell is connected right to our limbic system of the brain. The limbic system is responsible for memory, emotions, behavior and learning. So when you smell an essential oil, it’s literally affecting the part of your brain that’s responsible for your feelings. This then triggers your body to release specific chemicals and endorphins related to that particular feeling. Scientists have even found that various parts of our brains become more active depending on which scents we’re smelling. So this means that we can actually help our brains and bodies release various emotions and even reprogram our brains accordingly! It’s all pretty cool if you ask me! I’ve been working on releasing some emotions and came up with this blend to use. I suggest using this blend (or any oils) for emotional release, paired with some affirmations. Please make sure to check for any contraindications before using essential oils. I am not a medical doctor or psychiatrist. Please seek a professional for any emotional, physical and mental needs. Whether or not you’re an empath, this blend will be beneficial to you as we all need a boost of confidence sometimes. But if you are an empath, this blend will be especially helpful for you. What is this blend for? -This blend is especially good for the solar plexus chakra. -It’s beneficial for empaths as it helps you filter out others emotions from your own. -This blend helps boost your confidence so you can attract what you desire in life. -It has the added benefits of being good for your digestive system. -It raises the vibration of your aura so you can attract more high vibe things into your life, while blocking lower vibes. How do I use this blend? Use this blend every day until the blend is gone to strengthen your solar plexus chakra, bring about confidence and success into your life. This blend contains a citrus oil. Avoid applying anywhere on your body that the sun or UV rays may get to. Looking to get your own essential oils? I use and recommend dōTERRA essential oils. Whatever your ideas and feelings are in regards to spirituality, activism or spiritual activism, I urge you to check out this episode of The Goddess Life Podcast. It’s empowering, eye-opening and filled with LOVE. Our special guest this episode is the luminous Faye Wylder. Faye Wylder is a lightcaster, a preacher and a pray-er who helps others with her Breath Alchemy (which you will hear about in this episode). She also works intimately with Mary Magdalene and sharing her message. Faye is a deeply spiritual soul who is passionate about spiritual activism. In this episode Faye shares the importance of activism in the spiritual community, what activism looks like and how we can go about making a difference in the world. She also shares the story of Mary Magdalene and Jesus, and how Mary Magdalene herself was a spiritual activist. You can listen to The Goddess Life Podcast on iTunes, Google Play and Podomatic. Please subscribe and review if you enjoy! Whether you’re someone who struggles with confidence or you’re someone who is a generally confident person, we all have times where we could use a boost of confidence. In this video I share with you some easy but effective tips and tricks you can do anywhere and at any time, for immediate confidence. This episode was recorded for The Goddess Life Podcast. You can check out more from my podcast on iTunes, Google Play and Podomatic. Establishing a daily spiritual practice may seem like a daunting task to accomplish. I mean, we are busy as human beings. Jobs, family, responsibilities and more. But that’s all the more reason to start incorporating a daily spiritual practice into your life. In Episode 2 of The Goddess Life Podcast we discuss the benefits of having a daily spiritual practice and why it’s important. We also talk about simple and easy things you can do for your spiritual practice. Spoiler alert! It doesn’t have to be time consuming or elaborate. The Goddess Life Podcast is available on iTunes, Google Play and Podomatic. First and foremost, I don’t suggest making any changes to your medication without prior discussion with your medical doctor and/or therapist. In this video, I share a little about my history with depression and medication as well as some of the holistic and spiritual things I’ve done to get myself off my antidepressants and actually heal the hurt and what was causing my mental health issues in the first place. I made this blend for my thirteen year old daughter. I chose these oils for the blend because my daughter has a hard time falling asleep and staying asleep. Her little mind is always racing with anxious thoughts. These oils help to calm the mind and help you have a better nights sleep. Like I said, she’s a thirteen year old girl. So it’s no surprise that she’s having some slight self-esteem issues and mood management difficulties. The oils in this blend help balance those things. In a 10mL roller bottle, add two drops of each oil. Top off with a carrier oil (I used sweet almond oil). Apply to bottoms of feet and back of neck before bed. My daughter has been using this every night for about a week now and we’ve totally seen a difference. She’s falling asleep quicker, she’s staying asleep all night and her mood has improved and seems more balanced. I made this blend for my daughter, but this would be a great blend for adults as well. 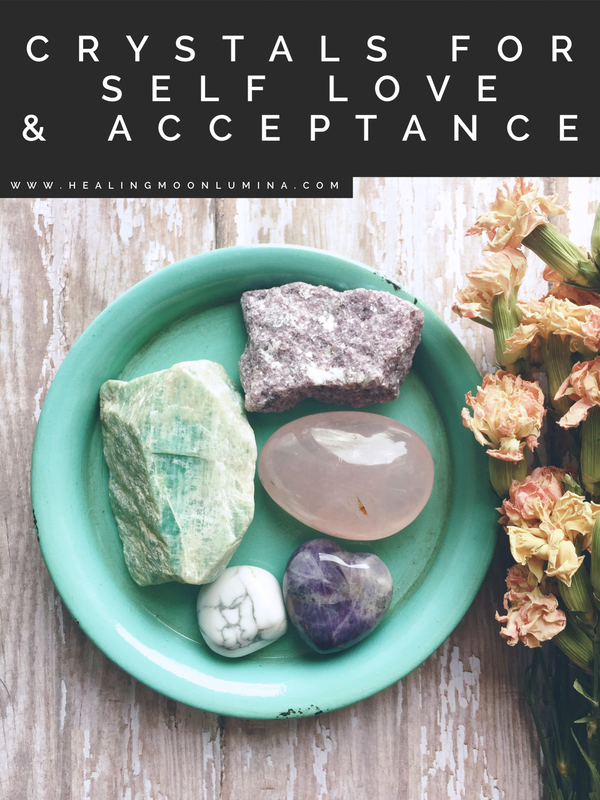 There are many crystals you can use to help facilitate self love and acceptance. Here is a list of five of my personal favorites. Amethyst helps you to get in tune with and connected to your emotions. A lot of us are good at blocking out our emotions, ignoring them or letting them control us. Amethyst will help you to work with your emotions. Howlite helps you to be totally comfortable with yourself. Silly quirks and all. This crystal encourages you to have a divine connection with your higher self. Connecting with your higher self, in a divine manner, helps you more easily work with your intuition and your true self. No list of self love crystals would be complete without talking about rose quartz. This is the Big Mama of love crystals. Self love, tenderness, compassion and inner peace and forgiveness.